Jamaica coffee broker. We are where to buy Jamaica coffee at affordable prices. We ship Jamaican coffee to your door. The Jamaica Blue Mountain Coffee festival 2019 takes place in the hills of the world renowned Blue Mountain this weekend. Everyone will congregate on historic grounds in Newcastle but what brands will come out in full force. Expect all the large ones including Jablum, Wallenford, Coffee Traders, Country Traders, Jamaica Standard Products, and so on. In terms of cafe popups expect Cannonball, Cafe Blue, Jablum & Wallenford, Coffee Roasters, Island Blue and of course Starbucks and more. People should be most excited about the surprises: The smaller brands coming out in force to increase marketability and exposure such as Plantation Blue and Bawk coffee. But we shall see this weekend at the coffee festival. The festival under the patronage of the Ministry of Tourism aims to get locals and foreigners to experience three days of Jamaican food, coffee and culture along the Blue Mountain Culinary Trail. There will also be indigenous arts and crafts showcases, live Reggae music performances and tours to some of Jamaica’s best kept secrets. Can’t be there but want to experience quality coffee. There’s always next year. People are drawn to the balanced cup that real Jamaica Blue Mountain coffee (JBM) offers. It’s chocolatey brewing with natural spice and fruit tones without bitterness. Jamaica coffee can be divided into two categories Blue and High Mountain. Jamaica Blue Mountain coffee comes only from the East of the island and usually costs US$50 per pound (450g) for roasted beans. High Mountain mostly from the west of the island usually sells for ÙS$25 per pound for roasted beans. Blue Mountain is luxury beans the equivalent of a Louis Vuitton bag for coffee. The classic profile is layered moving from chocolate to spice to fruit tones without bitterness. High Mountain is functional and would represent a beauiful leather backpack without a brand name. The profile moves from deep chocolate to lighter chocolate and spice with slight bitterness. Some critics say that over the last 20 years with the rise of Starbucks and specialty coffee, other regions have improved quality and now offer cups with similar quality to Jamaica Blue Mountain. Jamaica finds its natural competitors that speciality coffee in Latin America and the Pacific. So is Kona coffee better than Jamaica coffee. Or is Guatemalan coffee better than Jamaica coffee. What about Colombian coffee. These beans usually cost half that of Jamaica Blue Mountain quality beans. That said, the profile tends to be a cross between Jamaica Blue and Jamaica High Mountain beans. Two handbags of the same size says nothing about the quality and style. A Louis Vuitton handbag will always maintain its value due to its quality and taste, so too with Jamaica Blue Mountain. So is Jamaica coffee worth the money? Well it depends. Yes if you can guarantee that the beans are 100% from Jamaica rather than blends. Blended coffee is basically 10 to 30 per cent Jamaica Blue Mountain with 70 to 90 per cent beans from other origins usually Colombia. Blends costs half the cost of JBM or about US$25 per pound but really drinkers are getting foreign coffee. There are others and the list can adjust based on crop and batch quality. Here’s a list of the taste profiles of most of these brands along with fulfilment. Coffee lovers might wonder why Jamaica Blue Mountain coffee is twice as expensive as High Mountain coffee. Well Blue Mountain is in heavy demand in places like Japan where roughly 75 per cent of the total crop gets exported annually. Additionally, the Blue Mountain growing region is entirely on steep slopes. That limits cultivation in an is already limited zone. Its 8 hours of daily mist and fog creates a natural green-house effect which slow ripens the beans. Comparatively High Mountain is grown on flat lands or lowlands which enables better economies of scale. But also the coffee isn’t in heavy demand in Japan like the JBM. Click pic below to buy! Sister companies Wallenford Coffee and Mavis Bank Coffee Factory want to be in every luxury store in the world. But quality takes time to find new markets. Green beans are best handled by these companies directly but for roasted beans there are options. Each company ships roasted beans globally but they do so at prices which can at times be prohibitive. That’s where brokers enter the picture. Will a 8oz bag of coffee might sell for US$35 directly from these companies, resellers sometimes offer for US$25. Of course buy from sellers on platforms or websites with feedback and knowledge about coffee. Because most Jamaicans don’t drink coffee and think all coffee tastes great. Jablum and Wallenford were distinct companies until recently acquired by a millionaire, whose officers restructured both companies under a new entity called Specialty Coffee Holdings. The strategy of the Specialty aims to increase green and roasted bean sales to new geographies with special care for China. They want China but they fear bean duplication and thus are searching for a large distributor and roaster. Five years ago, Russia was a fastest emerging market but the sanctions and the drop in oil prices killed that market almost overnight. The strength of the Russian economy will one day rebound and we await its recovery. Contextually Japan buys about 75 per cent of total output of coffee from Jamaica. But whats more the remaining 25 per cent sent to other regions actually fights with the some of the 85 per cent repackaged from Japan back to the world. The Chinese are culturally tea drinkers, but coffee remains popular among youngsters and entrepreneurs which creates a market, particularly for the growing middle class. Following the Western Financial Crisis in 2008, the Japanese market retracted from buying large supplies of Jamaica coffee. The efforts to market Jamaica coffee in USA and Europe proved difficult with limited budgets. While offloading excess goods in Jamaica would prove futile as the island drinks instant coffee and teas. Additionally, hotels are not required to buy Jamaica coffee. The price of Jamaican Blue Mountain coffee remains at around US$27 per kilogramme in Japan for green beans,and US50 per kilogramme for roasted beans. A nice read about flashbacks chilling in a magical London cafe. Generally, I am unimpressed by Jablum. It sometimes tastes like hot water but costs three times that of Dunkin Donuts. Truth, the hot water tends to occur in Jablum ground coffees. So my advise to persons wondering about quality. Just avoid the ground coffess. But what about Jablum Gold whole beans. Is it worth the cash? Cupping coffee is what we do. We do these reviews to keep the companies honest and to let caffeineocrats know what to avoid and when to avoid it. We don’t need sterile labs. We prefer cupping where it counts, at home in the hills of the Jamaica Blue Mountains. 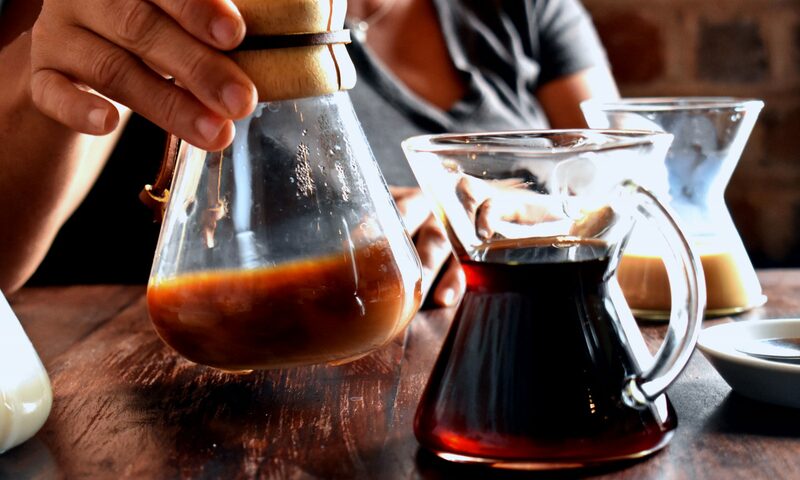 Follow the process of popping open a box of Jablum Gold and cupping via a chemex pour-over. History: Jablum Gold entered the market about 8 years ago as the curated version of its Jablum classic beans. In other words Jablum Gold sought to address concerns that Jablum was inconsistent with its taste. That the beans tasted like hot water. Like hot almonds. Anything but luxury coffee. So Jablum Gold entered the market with fatter better beans with more flavour. It always amazes me that the company maintained this elaborate packaging to this day. Packaging: The steps to unbox the coffee is reminiscent of the theatre involved in unboxing a watch. Pop the top apart and it reveals two sleeves: One arms to the left and the other to the right. It reveals a blue burlap bag which further reveals a shiny blue sealed bag. Aroma: Open with a pair of scissors shows fat swollen beans which smell of brown sugar. There are other spices but brown sugar dominates in a good way. Preparation: Grind in between fine and medium. Brewing method: Chemex, in an attempt to enhance crispiness and fruit essences. It’s based on previous knowledge that Jablum coffees generally enhances light chocolate tones and almond tones without much or any fruit. Comparatively utilising a french press would enhance the chocolate tones and mute any hints of fruit. Taste: Black currant which quickly transitions to deep chocolate and transitions to cream soda with low to medium acidity, and then leaves the palette with a smooth finish. Conclusion: 8.5/10 with Starbucks daily blend 6/10. So consider Jablum Gold for that affordable luxury. So more good news for buyers. When the mist of microclimate clears, new players are seen offering deals for their brands. They hype their beans as the best from the Jamaica Blue Mountain. Yeah so does everyone, yet some coffees taste ordinary and others amazing. New players in the retail scene include Bawk Coffee, Plantation Blue and one can even say Stoneleigh. These players all were involved in various aspects of the established trade and broke away to form their own brand. The more players means more competition in the sector which prides itself on a grandfather-taste which predates Starbucks and of course thirdwave. This taste is distinct and offers amazing coffee without the bells of whistles of modern coffees. JBM (Jamaica Blue Mountain) is just layered-complexity without the hype. So of course competition led to price cuts of between 10 to 20 per cent on shelves and on selling platforms like ebay and so on. In fact Stoneleigh actually slashed their retail rates by about 30 per cent just to move volumes. Let’s see what happens on reorders. The context however is that coffee prices in Jamaica have started to fall back in 2016/17 based on global supply and demand factors. But now come 2019 its competition that’s driving the dip at the roasted bean level. What does this mean for consumers… more choice at cheaper prices. But of course, we all know you can’t just buy JBM blindly. That’s why its important to know your source. We find that all the new brands offer quality but we’d recommend getting someone whether at the brand or a broker to cup it first prior to shipment.